On the night of 04/14–15/ 2014, 276 female students were kidnapped from the Government Secondary School in the town of Chibok. a primarily a Christian village, in Borno State, Nigeria. 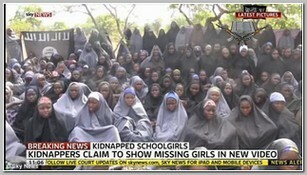 Responsibility for the kidnappings was claimed by Boko Haram, based in northeast Nigeria. On 10/17/2014 hopes were raised that the 219 remaining girls might soon be released after the Nigerian army announced a truce between Boko Haram and government forces. The announcement coincided with the six-month anniversary of the girls’ capture and followed a month of negotiations mediated in Saudi Arabia by Chadian president, Idriss Déby. On 5/5/ 2014, a video in which Boko Haram leader Abubakar Shekau claimed responsibility for the kidnappings emerged. On 07/01/2014, a businessman suspected of carrying out the kidnappings of the school girls, as well as the bombing of a busy market in northeastern Nigeria, was arrested. Military sources said that he was also accused of helping the Islamist militant group kill the traditional leader Emir of Gwoza. On 10/12/2014 it was reported that four girls from the original kidnapped group had escaped and walked three weeks to freedom in Nigeria. They said they had been held in a camp in Cameroon and raped every day. In 05/2015, it was reported that the Nigerian military had reclaimed most of the areas previously controlled by Boko Haram in Nigeria including many of the camps in the Sambisa Forest where it was suspected the Chibok girls had been kept. Although many women had been freed, none of the Chibok girls had been found. It was reported that some of the girls had been sold into slavery for N2,000 (about $10) each, others had been forcibly married to Boko Haram fighters. Following the Chibok abduction there was a sharp rise in young teen female suicide bombers attacks in Northern Nigeria and the Nigerian authorities are sure at lrast som of them were Chibok abductees. Boko Haram filmed a short footage apparently filmed in 12/2015 as part of negotiations between the government and Boko Haram, shows 15 girls, out of 276, in black robes identifying themselves. The footage was obtained by CNN and aired on Thursday 04/14/2016. Relatives of the girls marched in the capital, Abuja, say they have identified some of them . ** One of the missing Chibok girls, Amina Ali Nkek, has been found by a vigilante group, on Tuesday 05/17/2016, in the Sambisa Forest, in Nigeria, activists say, the first to be rescued since their capture two years ago. She was reportedly identified by a civilian fighter who recognised her.